Contributing to the music of friends is always a joy for me, and recently I did so on two new albums - "Haven" for my friends in the Epic US Band Kamelot ( due out in early May) and "Secrets of Angels" for my friends in the Epic UK Band "Karnataka" ( which is out now). Both sound superb and should be investigated. Oh yes, and if you are watching the latest Dreamworks animation "Penguins in Madagascar" with your kids, that is indeed me playing pipes and whistles! I also recently contributed to a Hans Zimmer project called "Tomorrowland" which was very interesting if you come across that. Well that it. Hope you all have a splendid 2015. I know. There is no excuse for such neglect of this site but actually, there IS an excuse...I have hardly been here to update it. Having just returned from 3 brilliant weeks in Australia with our 'Big Fun Band' it is time to tackle a whole pile of festivals, and a few isolated venue concerts, from May through to August. These are going to be really interesting for me and Ade because we have two new members in Tim Harries and Terl Bryant. These are old friends of mine ( they were with me in Iona) and the sonic splendour we have kicked up in rehearsals is really quite something. Do go to www.thebadshepherds.com for details and tour dates. What a glorious 2012. A full year of quite extraordinary concerts and adventures around the world with Nightwish. The carnival isn't over yet though - we have the Far East to come, and a whole rake of Festival shows throughout the summer. Do go and have a look at the dates on the official site or Facebook. AND ANOTHER BAD SHEPHERDS ALBUM! We just couldn't let it lie. When something is such massive fun like this is we just HAD to return, so off we go again. We have an Australian tour in April and a Big UK tour in the Autumn. We have a great songlist for the new album but I won't spoil it by tipping them. The album should be out in the Summer. Yes, for everyone who likes the new fandangled method of getting music mysteriously transfered to their micropodufribulators, you can now download the new album "Messages" from itunes, Amazon & Play. You can also download all previous albums from Amazon & Play. But who knows? Maybe a long spell away might fire it up again. Never say Never. I have just returned from a week of rehearsals in Finland and it is going brilliantly. We are all really excited about the tour because the adventure takes us EVERYWHERE - from the Ukraine to the Americas and the Antipodes to India. We will be touring the UK in August I think, but I will post the tour dates asap. The new music "Imaginaerum" is now available and my brothers and sister have reached dizzy new heights with a real "game changing" album. I was at the launch in Helsinki and to see literally hundreds of fans queing around the block in the rain and at Midnight(!) was very touching. The album went double platinum that very day...Huzzah! I have been invited to produce a new album for the Finnish singer Johanna - She is a very dear and close friend and has a sublime voice and spirit and I have been, for quite a while now, wanting to have a chance to place her in the kind of musical landscape befitting such an ethereal and pure personality. I am really excited by this and have already started writing and collecting music for it. Off to Finland again next week to get started. Wondrous times ahoy. Sorry everyone! I had such a ludicrously busy 2010 I didn’t have time to update the site but now, finally, here is the news…. Yes indeedy, we are making an album together this summer. For those who don’t know Gordon, he is not only a splendid man, but also one of the worlds Grand Masters of the Acoustic Guitar and the pair of us are very excited about what we may come up with. Hopefully we shall have it ready before the end of the Autumn. Watch this space. The new album, which I arranged and produced for Barbara, is now available through Greentrax Records. I am deeply delighted with this music. We will be performing selections from it at a few festivals this summer with the glorious band - it is fiery and wild so do check out the tour dates. This is another collaboration with my splendid old pal David Rohl who I worked with on his latest Mandalaband albums. David is also a respected Egyptologist and writer and we are both very interested in the subject of the Gods and their origins, so this is going to be an Orchestral concept album ( there, I said it ) and I shall be composing the music and David the words…more news on this further down the road…. A compilation of my music will be released this coming autumn. It will consist of tracks from my three solo albums and other unreleased music from over the years. Well, thats it for now and here’s hoping you dive into a glorious summer. Off we go! 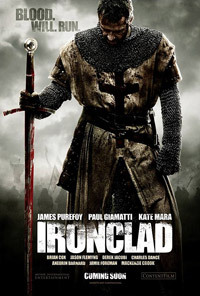 Back to the 13th Century we go... 'Ironclad' is a major new film scheduled for release sometime this summer and is about the Knights Templar and the seige of Rochester Castle. It has a stellar cast and looks grungy and, er, very bloody. I played a load of Pipes and Low whistles on this score so watch out for it. I have just finished a day in the splendid Abbey Road studios working on the new Ridley Scott epic movie 'Robin Hood' starring Russell Crowe and Cate Blanchett. A great time was had and I can tell you that Ridley is a sound bloke - which is always a relief when you meet one of your heroes! The Bad Shepherds have been nominated for a BBC Folk Award 2010 for 'Best Live Act'! The ceremony is on the 1st of Feb so watch this space. Also, watch the Bad Shepherds website for live dates this year as, up to now, we have 66 shows up to October!! I am delighted to report that I was voted 'Best Roots Musician' at this years 'CLASSIC ROCK SOCIETY' awards evening. Unfortunately I couldnt be at the ceremony, but thanks to everyone who voted. I will be arranging and producing a third album for Barbara Dickson (this year sometime..er..). We have put together a setlist of mailnly traditional songs and it will be cut from the same luxurious cloth as the previous two albums. And as usual at this time of year, I will be out on tour through February/March with Barbara and the Band. Bad Shepherds Nominated for Best Live Band! The Bad Shepherds have been nominated for 'Best Live Act' in the 2009 BBC Folk Awards! The Awards take place on Monday 1st February. For more details see the BBC Folk website. The first reviews of the album are trickling in and can be read here. A recent interview with Troy for the Dutch music magazine "IO Pages" can also be found there. After being a member for 14 years, Troy has left the band Iona - "I have had a wonderful time with my friends in Iona and am very, very proud of the albums we made together. But, as in all life, things change. After extended periods of no activity we have found ourselves with a very different musical and philosophical direction. We have parted as great friends should, with a sad-happiness and I wish the band all the very best wishes for the future". After much anticipation, the new album by the new band "The Bad Shepherds" ( formed by Troy with Ade Edmondson) is available! It has been getting rave reviews and can be purchased from the shop at the website and at the live shows - the dates for which can be seen here. 'The Madness of Crowds' - Now Shipping!! The most important event of the year is the release of "The Madness of Crowds" - 6 years in the making. The album is NOW AVAILABLE and the first copies have been shipped. The first few thousand are strictly collectors items - hand constructed and a package of rare beauty. When these are gone, the album will be available as a standard digi-pack. The album is available only from this website for the first month and then, on the 11th of May, it will be released to the usual outlets through 'Voiceprint'. Downloads will be available from 'Jhana Music' at the same time. Troy is featured on the new album by his splendid friends, "Nightwish"....this is a live recording and is called "Made in Hong Kong...and other places". Troy plays on two tracks recorded at the first live appearance with the band in the London Astoria. 'The Madness of Crowds' - starts shipping on April 9th!! It is now 2009 and welcome to this wonderful new site designed and built by my splendid friend, Tim. He has also designed the cover for the new album ' The Madness of Crowds'...and yes.. finally it is done! It is now available to pre-order from this site and will only be available HERE for the first month of its life (shipping starts on Thursday the 9th April!). The album package is completely 'custom built' by hand, is very beautiful, and totally unique! It has proven too elaborate to mass produce in a factory and as a result, the first 5,000 will be seen as collectors pieces. I will be doing lots of interviews over the coming months so watch out for those and there are some 'online only' album notes available HERE exclusively. And then when I get home, it is into rehearsals with our new band "The Bad Shepherds" and out we go to perform at LOTS of summer festivals!